This class provides an interface through which checkers can create individual bug reports. Definition at line 75 of file BugReporter.h. Definition at line 90 of file BugReporter.h. Used to track unique reasons why a bug report might be invalid. Definition at line 147 of file BugReporter.h. Definition at line 91 of file BugReporter.h. Definition at line 87 of file BugReporter.h. Definition at line 111 of file BugReporter.h. Definition at line 110 of file BugReporter.h. Definition at line 89 of file BugReporter.h. Definition at line 88 of file BugReporter.h. Definition at line 166 of file BugReporter.h. Definition at line 169 of file BugReporter.h. Definition at line 174 of file BugReporter.h. Create a BugReport with a custom uniqueing location. The reports that have the same report location, description, bug type, and ranges are uniqued - only one of the equivalent reports will be presented to the user. This method allows to rest the location which should be used for uniquing reports. For example, memory leaks checker, could set this to the allocation site, rather then the location where the bug is reported. Definition at line 184 of file BugReporter.h. Definition at line 2048 of file BugReporter.cpp. This allows for addition of meta data to the diagnostic. Currently, only the HTMLDiagnosticClient knows how to display it. Definition at line 293 of file BugReporter.h. Add new item to the list of additional notes that need to be attached to this path-insensitive report. If you want to add extra notes to a path-sensitive report, you need to use a BugReporterVisitor because it allows you to specify where exactly in the auto-generated path diagnostic the extra note should appear. Definition at line 269 of file BugReporter.h. Definition at line 281 of file BugReporter.h. Add a range to a bug report. Ranges are used to highlight regions of interest in the source code. They should be at the same source code line as the BugReport location. By default, the source range of the statement corresponding to the error node will be used; add a single invalid range to specify absence of ranges. Definition at line 327 of file BugReporter.h. References addVisitor(), clearVisitors(), getRanges(), and clang::SourceRange::isValid(). Add custom or predefined bug report visitors to this report. The visitors should be used when the default trace is not sufficient. For example, they allow constructing a more elaborate trace. registerConditionVisitor(), registerTrackNullOrUndefValue(), registerFindLastStore(), registerNilReceiverVisitor(), and registerVarDeclsLastStore(). Definition at line 2029 of file BugReporter.cpp. Remove all visitors attached to this bug report. Definition at line 2044 of file BugReporter.cpp. Disable all path pruning when generating a PathDiagnostic. Definition at line 221 of file BugReporter.h. Definition at line 191 of file BugReporter.h. Return the canonical declaration, be it a method or class, where this issue semantically occurred. Definition at line 2054 of file BugReporter.cpp. References clang::LocationContext::getDecl(), clang::ento::ExplodedNode::getLocationContext(), and clang::LocationContext::getStackFrame(). Definition at line 208 of file BugReporter.h. Definition at line 206 of file BugReporter.h. Definition at line 297 of file BugReporter.h. References ExtraText, getLocation(), and SM. Return the "definitive" location of the reported bug. While a bug can span an entire path, usually there is a specific location that can be used to identify where the key issue occurred. This location is used by clients rendering diagnostics. Definition at line 2211 of file BugReporter.cpp. 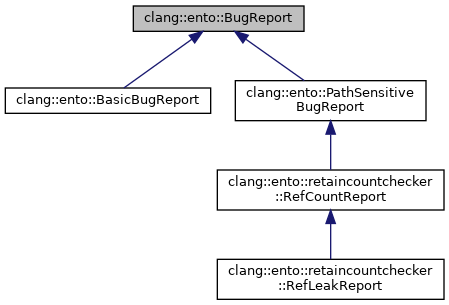 References clang::ento::PathDiagnosticLocation::createEndOfPath(), clang::ento::BugReportEquivClass::~BugReportEquivClass(), clang::ento::BugReporterData::~BugReporterData(), and clang::ento::GRBugReporter::~GRBugReporter(). Definition at line 286 of file BugReporter.h. Get the SourceRanges associated with the report. Definition at line 2194 of file BugReporter.cpp. Referenced by addRange(), and clang::ento::retaincountchecker::RefCountReport::getRanges(). Definition at line 210 of file BugReporter.h. Definition at line 2176 of file BugReporter.cpp. References clang::ProgramPoint::getAs(), clang::LocationContext::getCFG(), clang::CFG::getExit(), clang::ProgramPoint::getLocationContext(), GetPreviousStmt(), and clang::ento::PathDiagnosticLocation::getStmt(). Get the declaration containing the uniqueing location. Definition at line 314 of file BugReporter.h. Get the location on which the report should be uniqued. Definition at line 309 of file BugReporter.h. Definition at line 2123 of file BugReporter.cpp. Definition at line 2131 of file BugReporter.cpp. Definition at line 2119 of file BugReporter.cpp. Definition at line 2143 of file BugReporter.cpp. True when the report has an execution path associated with it. A report is said to be path-sensitive if it was thrown against a particular exploded node in the path-sensitive analysis graph. Path-sensitive reports have their intermediate path diagnostics auto-generated, perhaps with the help of checker-defined visitors, and may contain extra notes. Path-insensitive reports consist only of a single warning message in a specific location, and perhaps extra notes. Path-sensitive checkers are allowed to throw path-insensitive reports. Definition at line 204 of file BugReporter.h. Returns whether or not this report should be considered valid. Invalid reports are those that have been classified as likely false positives after the fact. Definition at line 237 of file BugReporter.h. Definition at line 2087 of file BugReporter.cpp. Definition at line 2097 of file BugReporter.cpp. Definition at line 2108 of file BugReporter.cpp. Definition at line 2113 of file BugReporter.cpp. Marks the current report as invalid, meaning that it is probably a false positive and should not be reported to the user. The Tag and Data arguments are intended to be opaque identifiers for this particular invalidation, where Tag represents the visitor responsible for invalidation, and Data represents the reason this visitor decided to invalidate the bug report. Definition at line 250 of file BugReporter.h. Profile to identify equivalent bug reports for error report coalescing. Reports are uniqued to ensure that we do not emit multiple diagnostics for each bug. Definition at line 2066 of file BugReporter.cpp. References GetCurrentOrPreviousStmt(), clang::ento::PathDiagnosticLocation::isValid(), and clang::ento::PathDiagnosticLocation::Profile(). Specifically set the Decl where an issue occurred. This isn't necessary for BugReports that cover a path as it will be automatically inferred. Definition at line 260 of file BugReporter.h. Indicates whether or not any path pruning should take place when generating a PathDiagnostic from this BugReport. Definition at line 218 of file BugReporter.h. Iterators through the custom diagnostic visitors. Definition at line 349 of file BugReporter.h. Definition at line 350 of file BugReporter.h. Definition at line 94 of file BugReporter.h. Definition at line 95 of file BugReporter.h. Definition at line 97 of file BugReporter.h. Referenced by clang::ento::BugReporter::generatePathDiagnostics(), and getBugType(). A set of custom visitors which generate "event" diagnostics at interesting points in the path. Definition at line 133 of file BugReporter.h. Used for ensuring the visitors are only added once. Definition at line 136 of file BugReporter.h. Definition at line 98 of file BugReporter.h. Definition at line 100 of file BugReporter.h. When set, this flag disables all callstack pruning from a diagnostic path. This is useful for some reports that want maximum fidelty when reporting an issue. Definition at line 141 of file BugReporter.h. Definition at line 105 of file BugReporter.h. Definition at line 107 of file BugReporter.h. A set of location contexts that correspoind to call sites which should be considered "interesting". Definition at line 129 of file BugReporter.h. A (stack of) set of regions that are registered with this report as being "interesting", and thus used to help decide which diagnostics to include when constructing the final path diagnostic. The stack is largely used by BugReporter when generating PathDiagnostics for multiple PathDiagnosticConsumers. Definition at line 125 of file BugReporter.h. A (stack of) a set of symbols that are registered with this report as being "interesting", and thus used to help decide which diagnostics to include when constructing the final path diagnostic. Definition at line 118 of file BugReporter.h. If non-empty, this bug report is likely a false positive and should not be shown to the user. Definition at line 154 of file BugReporter.h. Definition at line 101 of file BugReporter.h. Definition at line 108 of file BugReporter.h. Definition at line 106 of file BugReporter.h. Referenced by addNote(), and clang::ento::BugReporter::generatePathDiagnostics(). Definition at line 99 of file BugReporter.h. Definition at line 103 of file BugReporter.h. Definition at line 102 of file BugReporter.h.